Repellents are a very personal choice. Some people don’t want to take any chances and use the most potent and toxic product available. However, I would urge you to consider the personal health implications of using these. On the other hand, there are effective “natural” repellents available that can also have toxic effects if not used in moderation. The biggest difference between the two is the effects it has on pets, livestock, wildlife, soil health, and groundwater. In this arena, natural wins! I encourage you to do your own research to determine the pros and cons of any product you consider using. Make an educated decision for yourself and your family. If you have children, be sure to read all warning labels and thoroughly research products before using them. Discuss options with your pediatrician. Whatever you choose, please make sure you use a repellent. Wearing Repellent Clothing when you spend time outdoors is a great way to protect yourself and insures that you don’t get lazy about prevention. 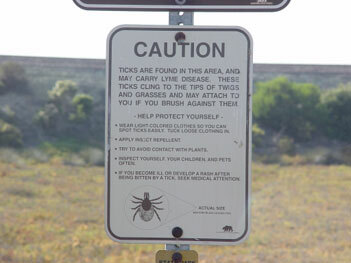 You still need to do tick checks, and throw them in the dryer afterwards. But it helps reduce the risk significantly. Permethrin is the most effective synthetic tick repellent available. It has been proven to cause some problems with toxicity, so it should not be used directly on the skin. It is best used for clothes and yard. It is also toxic to cats, so do not let your cats on your sprayed clothing or outside until it has dried completely and prevent ingestion. For this reason, you should never apply topical dog medications or human sprays on cats. Deet tends to be less effective than Permethrin mostly because it evaporates quickly. If you prefer Deet, try a time release version. Sulfur works as a tick repellent. It is not toxic to humans, pets, or livestock, so can be used in powder form to sprinkle in the yard. I’m not sure if it will last through rain, etc… or its efficacy. There are MSM (Methylsulfonylmethane) supplements that contain sulfur and also help with many of the cognitive and joint symptoms that go along with Lyme. In fact, sulfur is required for proper brain and cell function. And you can get it naturally from leafy greens. It’s win win. The only caution to have is for those with a sulfur sensitivity. Warning: DO NOT use natural or botanical repellents that contain essential oils IN COMBINATION WITH other synthetic repellents. This can allow toxins to be carried into the blood stream. See the Essential Oils page for more details and precautions. Cedar Oil is proven to be one of the most effective Repellents and Pesticides for arthropods. And the best part, it is safe for people, pets, and the environment. Cedarwood Oil used therapeutically gently stimulates the circulatory system (do not use internally). Note: There is a myth that cedar oil is harmful for rabbits. Studies show that this is not the case. However, frequent Cedar Oil use, use in large amounts, or ingestion by humans or animals can be toxic, so exposure should be limited. You can purchase it here and a portion of the proceeds will go to the Harrisburg Area Lyme Disease Support Group. Citronella is not really very effective. That’s what all those garden candles and tiki torches contain, although it is usually a synthetic version of it. For anyone who has tried this, I feel like it repels me more than it ever repelled a mosquito let alone a tick. Unless you like the smell, I would avoid this option. Plus, it can be toxic in large amounts. Garlic is an effective repellent, but is not good for use on pets. It tends to be more effective on mosquitos than on ticks. I would save this one for yard use. Enjoy your garlic with your food for good health also! Lemon Eucalyptus is a specific type of Eucalyptus. It is not a mixture of other Eucalyptus oils and Lemon Oil. It has a strong odor. It can cause skin irritation and does need to be limited to no more than 2 applications per day. Toxicity from Eucalyptus oil can and does occur. Neem oil has proven to be an effective tick and insect repellent. It is also an insecticide. It is believed to be safe for use on the skin. Rose Geranium is also an effective insect repellent and has shown to be effective against ticks. As with all essential oils, care should be taken to dilute and use sparingly to avoid toxicity.